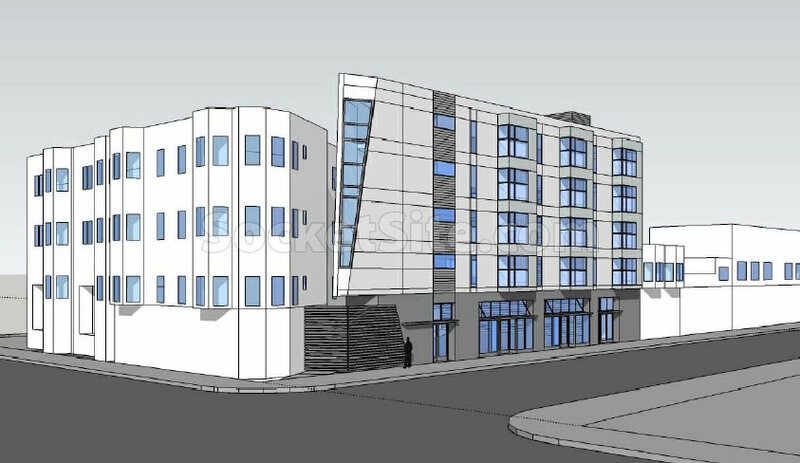 Plans for a wedge-shaped building to rise up to five stories in height on the Mission District parking lot at the corner of Capp and 24th Streets have been drawn. 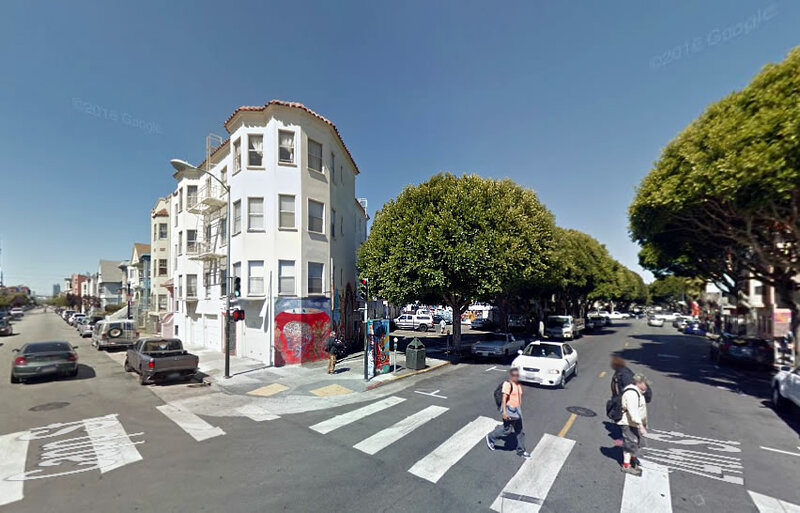 As designed by Weisbach Architecture Design, the 3236 24th Street project would include 21 studio apartments over 2,100 square feet of commercial space, divided into three storefronts, fronting 24th Street. 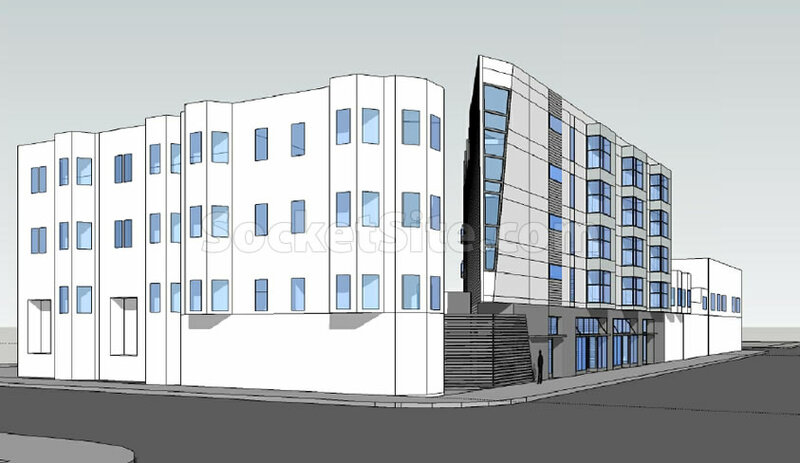 And as envisioned, 18 of the 21 units along Calle 24 would be market rate, which could raise some local hackles. We’ll keep you posted and plugged-in as the plans progress. Nice! interesting! Modern! Build it! I’ll second that! Nice infill project for sure. #love, but save/protect those trees! They are cutting them down randomly and not replacing them. Need more green in the mission. Are they really cutting them down? Doesn’t look like they have to. The type of ficus planted along 24th are high maintenance and constantly dropping branches and ripping up the sidewalk around town. I hope the city figures out how to replace these with a new alternative, it feels like replacing them with the same species would be a mistake. See namelink for more. They are replacing the trees. after they cut the trees to a stump, they let the roots rot for a year or two to make it easier to pull out without ripping up half the street, then they plant new trees. those old ficus’ are a major hazard and have to go. there is a plan for gradual replacement over time so the street is not suddenly stripped of trees. Yeah, As trees have been dying or damaged along 24th they’ve been taking them out, as BigV says. Not only are those ficuses dangerous (constantly dropping huge limbs) and sidewalk destroying, they are also incredibly dense and block out all sunlight to the street or adjacent buildings. They are truly the WORST street tree for San Francisco, and they can’t all go soon enough in my opinion. considering it’s proximity to BART, etc, i’d like to see it be a garage-less building and be 10+ stories. roof deck too. No, I wouldn’t. it’s time we stopped with constant, never ending commentary by every citizen in this city about every single personal preference when it comes to new buildings. It’s why projects take forever to get built, and in part why they cost so much. Let the professionals do their job, meet the code requirements get things built. 10+ stories – yes. Garageless – no, there needs to be ample parking below level for 2 cars per unit imho. 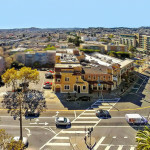 Three more storefronts is a boon to the neighborhood, where demand is off the hook. This space has always stoked the ocd in me and I’ll be glad when it’s built out. I feel the same. Such a weird remnant parcel. Strange that it’s been vacant all these years. Looks like a storm-trooper housing complex…. Trees definitely, possibly an improved corner condition (is there an open green back space?) Plan? Just out of curiosity, how many Storm-Trooper Housing Complexes have you visited? And, dare I ask, do you actually know what a Storm Trooper IS? The design fits right in with the computer-rendered version of the neighborhood. So these are going to be 100% studios? 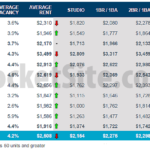 Is there any reason why some wouldn’t be 1 or maybe 2 bedrooms? I believe it was an old rail line, not a streetcar line. Futurist is correct. Freight rail line. Same as what is currently Parque El Ninos. And Juri Commons. Among other places. It’s very interesting to chart that RR ROW through the Mission. yes, the old rail SF-SJ line that included the Bernal Cut. Some history and photos of the trains on this line and in the Mission. Not just freight actually. The line (owned by Southern Pacific) ran passenger trains until 1932, with freight continuing until 1940. For a time, that very spot was also a passenger rail station. You could go to half moon bay and santa cruz from there.